This debut novel from the author of The Drunken Botanist is based on the forgotten true story of one of the nation's first female deputy sheriffs. Constance Kopp doesn't quite fit the mold. She towers over most men, has no interest in marriage or domestic affairs, and has been isolated from the world since a family secret sent her and her sisters into hiding fifteen years ago. One day a belligerent and powerful silk factory owner runs down their buggy, and a dispute over damages turns into a war of bricks, bullets, and threats as he unleashes his gang on their family farm. When the sheriff enlists her help in convicting the men, Constance is forced to confront her past and defend her family -- and she does it in a way that few women of 1914 would have dared. 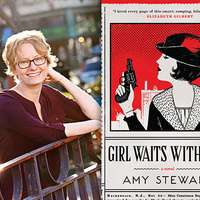 Amy Stewart has written six nonfiction books on the perils and pleasures of the natural world, including four New York Times bestsellers: The Drunken Botanist, Wicked Bugs, Wicked Plants and Flower Confidential. She is the recipient of a National Endowment for the Arts fellowship, the American Horticulture Society's Book Award, and an International Association of Culinary Professionals Food Writing Award. The Ivy Bookshop will have copies of the author's books for sale at a book signing following the program. Writers LIVE programs are supported in part by a generous grant from PNC Bank.